Why did the e-commerce giant stop carrying GoPro’s latest camera? GoPro (NASDAQ:GPRO) recently stopped selling its latest Hero 5 cameras on Amazon (NASDAQ:AMZN) in an abrupt move which may dent its sales during the crucial holiday quarter. GoPro didn't offer any reasons for the discontinuation, but Longbow Research analyst Joe Wittine speculated that it was likely due to a "pricing squabble, when a retailer lists the product below the agreed-upon floor price." GoPro claims that the suspension is temporary, and that sales should resume in late October or early November. But if the dispute drags on, it could take a big bite out of GoPro's top line. Piper Jaffray analyst Erinn Murphy estimates that GoPro depends on Amazon for about 12% to 14% of its total sales. Amazon's prices also impact major retailers like Best Buy, Target, and Wal-Mart, which all agree to match Amazon's non-Prime prices. If Amazon sells the Hero 5 Black for less than $400 or the Hero 5 Session for less than $300, it would pressure other retailers to lower their prices. 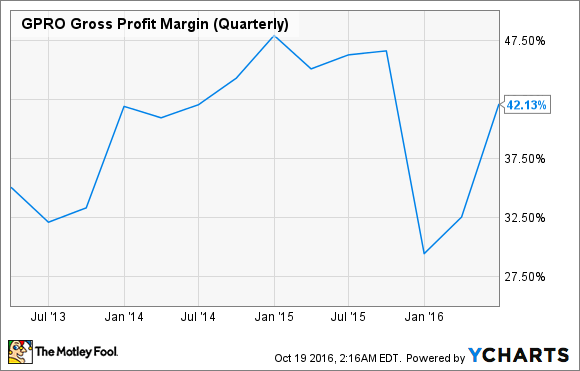 If that happens, GoPro's gross margins -- which have already been very wobbly over the past year -- could tumble. GoPro also probably doesn't want its action cameras, which are marketed as "premium" devices, to be tossed in the same discount bin as the so-called "GoPro knockoffs." Last November, GoPro stock tumbled after Piper's Murphy warned investors about pricing pressures on Amazon and the appearance of GoPro cameras on flash sales sites like Liberty Interactive's Zulily, Groupon, and RueLala. Those discounts shaved an average of 16% to 34% off the list price of GoPro's cameras. Meanwhile, Amazon doesn't mind selling products below the list price, as long as doing so drives sales volume. In fact, much of Amazon's early success was attributed to offering products well below their list prices. However, that practice caused clashes with several companies over the years, most notably book publishers which wanted to set their own prices rather than allowing Amazon to do so. Should GoPro investors be worried? GoPro's revenue has declined annually for three consecutive quarters, and sales are expected to fall again in the third quarter before returning to growth in the fourth. Analysts expect GoPro to report 55% sales growth during that quarter on robust sales of the Hero 5 and Karma, and GoPro expects that growth to lift its bottom line back into the black. However, $677 million in sales would be a record quarter for GoPro. The company's strongest quarter to date was the fourth quarter of 2014, when it reported sales of $634 million on strong demand for its Hero 4 devices. But now that the action camera and drone markets are both much more saturated than they were two years ago, beating that record quarter could be very tough. The Hero 5 also faces plenty of similar rivals this holiday season. Garmin's (NASDAQ:GRMN) Virb Ultra 30 offers similar specs as the Hero 5 Black but adds additional motion tracking sensors for the same price. Samsung's Gear 360, which costs $350, lets users capture 360-degree photos and videos. Virb Ultra 30. Image source: Garmin. Budget-conscious buyers might buy Yi Technology's 4K Action Camera 2, which sports the same chipset as the Hero 4 Black but adds a bigger battery, image stabilization, and a touch LCD screen for $250. Lastly, GoPro could struggle to convince its existing Hero 4 Black users to upgrade, since it already matches the top video setting (4K at 30 fps) for the Hero 5 Black. GoPro's clash with Amazon definitely isn't good news for the action camera maker, but investors shouldn't jump to conclusions yet. Oppenheimer analyst Andrew Uerkwitz reminded investors that sales were traditionally slower in September and early October anyways, as "people gear up for the holiday season" in November and December. Therefore, if GoPro resolves the issues with Amazon in a timely manner, the impact on its holiday quarter sales should be negligible. But if the dispute drags on, it might cause a disappointing miss that would likely sink the stock.